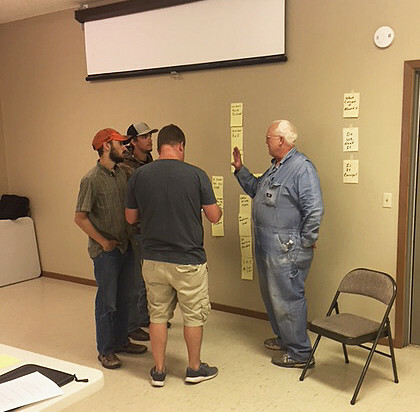 United Steelworkers (USW) Local Union 11-560, representing members at Bobcat Corporation in Gwinner, N.D., participated in union health and safety training. July 18 and 19, 2017 consisted of Incident Investigation, and on July 20, the training concluded with Hazard Mapping. “The Incident Investigation class included logic tree diagramming, which is a great tool to get to the root cause of an incident. Bobcat has incorporated the logic tree into their incident investigation report forms,” Frank Helebrant of Local 2-213 said. Helebrant, along with Dennis Delie of Local 2-213, facilitated both courses and are long-time USW Tony Mazzocchi Center worker-trainers. “A group of 33 trained in the Hazard Mapping class. The group found over 40 different hazards that they have been working around for many years. Through the Hazard Mapping process, the group was able to address many of these hazards and were able to come up with recommendations to design, or mitigate the hazards,” Helebrant said. Photos courtesy of Frank Helebrant. Training reported in this brief is supported by the National Institute of Environmental Health Sciences of the National Institutes of Health under award number U45ES006175. The content is solely the responsibility of the authors and does not necessarily represent the official views of the NIEHS, NIH.